The Caldon Canal is widely seen as one of them most interesting waterways in the country. The canal was built to carry limestone for the iron industry and flints for the pottery industry. It is still steeped in history, with fascinating industrial buildings visible along the Stoke section. Further along, you may see a steam train chugging along where the Churnet Valley Railway passes close to the canal. 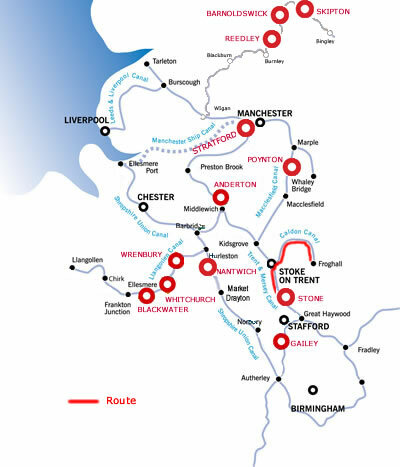 The outstanding scenery along the route means there is lots to see for boaters, walkers and cyclists. 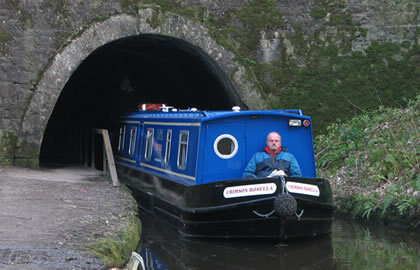 The unusually low Froghall Tunnel may be a challenge for boaters, but beyond it, you will be rewarded by arriving at the tranquil and secluded Froghall Wharf. It is very much a canal of contrasts, beginning in the centre of the Potteries but also passing through remote countryside on the summit level and the Churnet Valley, often called 'Little Switzerland' because of the lovely unspoilt landscape. Take a Steam train ride through the beautiful countryside on the Churnet Valley Railway. Leaving Stone, you continue through the last locks of the Stonne flight, look out for the little tunnel under the road for boat horses by lock 29. You will be cruising up the valley to Meaford, via a series of locks and bridges, and for a time, the railway runs adjacent to the canal. There is a wide choice of shops to re-stock provisions on the journey through Stoke. Close to bridge 112 is Churchill China, a factory shop selling bone china. The Caldon canal is to the right just after the Stoke Flight of locks, you soon pass a statue of James Brindley, builder of the Trent & Mersey canal. The Etruria Industrial museum is at the junction of the Calson Canal with the Trent & Mersey.This is a Victorian steam-powered potter's miller's works, built in 1857 and which ground bone, flint and stone for the Potteries industry. There are moorings for visitors. The first 2 locks are combined in a staircase, Planet Lock is soon reached with shops and pubs close by. 1/4 mile north of bridge 4 is Hanley park, where there are good moorings. Moor here for the night it is 4.5 hours to here. Buses from the city centre ,and Hanley will take you off to Alton Towers, the countrys most renowned Theme park with an array of awesome rides if you have a day spare . Also the railway station has trains to there. If you do not want to moor up in Stoke, cruise onto Milton, a little village on the outskirts, there are a couple of pubs by bridge 18, it is an extra 1.5 hours cruising, so 6 hours from Barlaston. Five locks at Stockton raise the canal uo to 484 ft above sea level to the summit. There is a friendly farm shop near Bridge 28, and shops 250 yds north west of bridge 28 . At Hazelhurst the canal divides and the Leek branch goes away to the right before crossing the mainline on an aqueduct and going away to your left. You can make the small detour up here if you wish to its terminus about 2.5 miles away carrying on up to Leek and visiting the Antique shops (approx) a mile from the mooring point at bridge 9. Carrying along the main line along the Churnet valley accompanying the River. Deep Hayes Country Park is off to your right, access from Bridge 39. It is a delightful mixture of woods and meadows, and was orignially an industrial area where coal and clay were extracted. Another 2 locks bring you down to the village of Cheddleton and you can moor here for the night, it is 6.5 hours from Hanley Park. There is a charming flint mill by the canal, and you can watch 2 water wheels driving the flint grinding pans in a picturesque setting. The Red Lion pub is back at the locks by Bridge 43, The Boat Inn is canalside at bridge 44. Churnet Valley railway is by bridge 44- a preserved standard guage railway running steam trains along the 10.5 mile of track .The Churnet Valley Railway takes you on a journey back to the classic days of railway travel on a rural line that passes through beautiful countryside known as Staffordshire's "Little Switzerland". It runs weekends and bank holidays, but look on their website for full details. The canal continues its pretty journey and the canal shares the same course as the River Churnet for some distance. At Consoll Forge by bridge 49 is a hand thrown pottery & craft centre & ceramics, especially tea pots. The Black lion pub here is in a splendid setting with a fine garden. Beyond Consall Forge the canal gets very narrow , so make sure nothing is coming from the other direction as you may have to reverse. The Canal is enclosed by steep and thickly wooded hills, almost untouched by mankind. You pass old limekilns on the way to Flint Lock, the last lock before the end of the canal. As you exit the tunnel there are plastic strips which mark as a gauge to let you know whether your boat will fit through Froghall tunnel or not. The dimensions of the tunnel are only 4ft 4in high and 5ft 6 inches wide and the water levels can fluctuate so all of our boats should turn just before the tunnel and moor up and walk to the very pretty village of Froghall. Froghall these days comprises almost entirely of factories and dwellings associated with Thomas Bolton's copper works. The tea rooms at Kingsley & Froghall station are worth a visit. Froghall basin just beyond the tunnel has a picnic area and shop and limekilns. Once a hive of industrial activity, this old canal-side wharf is a lovely tranquil picnic spot alongside the terminus of the Caldon Canal and Uttoxeter Canal Basin. There are way-marked walks that lead from the site onto the rights of way network and canal towpath. This is a popular spot for walkers to begin exploring the Churnet Valley and there are grade 2 listed Lime Kilns on the site and other remnants of the industrial past can be found in the wooded valley beyond.